Young writers need to recognize how important written communication is to those they love and respect. This poster set is a great way to get that conversation started. 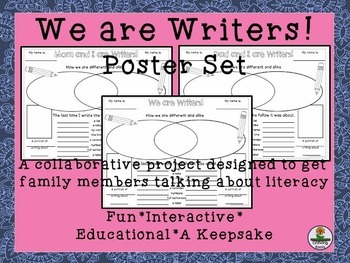 Working on a poster with a favorite adult or family member allows families to discuss literacy in a low-stress way. Three options are generic enough so you can choose the one best suited for each child's family dynamics. It fosters intergenerational bonds. 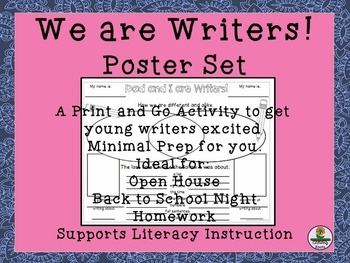 The poster set is perfect for a beginning of year homework assignment, Back to School Night or Open House. The finished product, each unique, looks great hanging in the hall. Morning Meeting Greetings: 50 Fast and Engaging Cards for Student Independence. Reading Strategy Homework – Engage in authentic practice! Any level! Any book!. Volunteer Thank You Cards – Kid-created and Adult-appreciated! Each is unique!. •	Go to your My Purchases page (you may need to login). Beside each purchase click on the Provide Feedback button. You'll be taken to a page where you can give a rating and leave a short comment about the product. I value your feedback.